It was midnight before we finished stowing foodstuffs purchased during our provisioning binge, and the three of us had hardly closed our eyes when alarms began to ting. Three o’clock had come quickly, and putting coffee to steep was the first order of business. We’d avoided entering Golfito after dark, but having seen the channel in daylight, we dared to depart with the wee-hour ebbing tide. Two-knot propulsion from the strong tidal shift would accelerate our pace toward the open sea, some 20 miles south. Lori and I stood watch at the bow with the handheld VHF radio and spotlight, scanning the debris-ridden bay for flotsam, jetsam, and buoys. 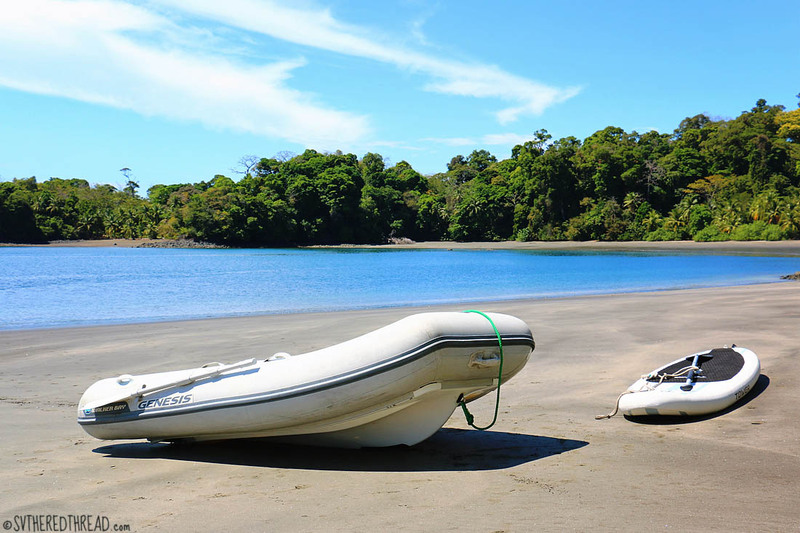 A chilly breeze skidded down shadows of the mountains that guard the bay, sending shivers racing down our bare arms, as we crept toward the long, black tongue of Golfo Dulce. 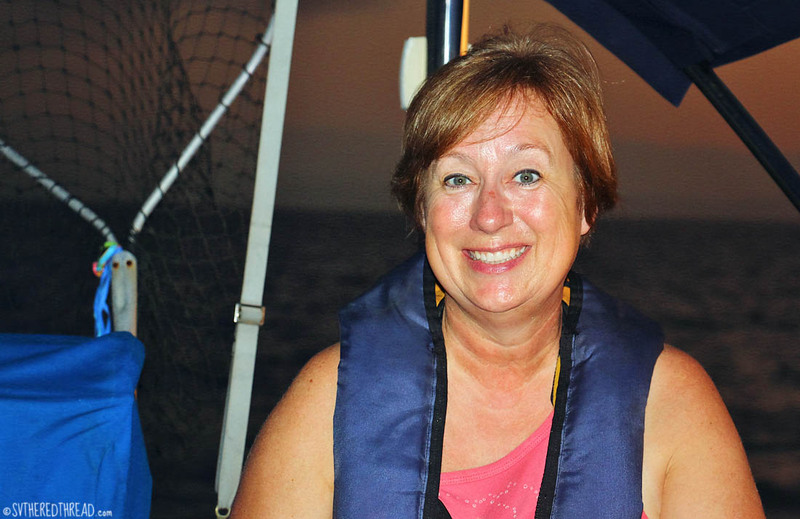 Lori was about to meet the Pacific for the first time aboard a sailboat. We were well-caffeinated and more than a little excited. The sky was embroidered with thousands of sparkling stars and the sliver of a waning moon. Sunrise was a sultry peach, and as the day awakened, we saw the outline of an enormous ship etched against the hazy outline of Costa Rica’s southern mountains. 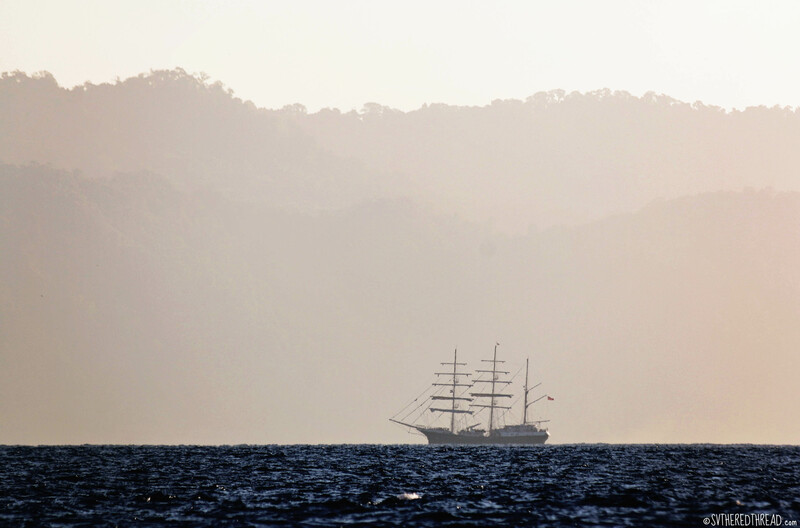 Tenacious, a 213-foot long, 3-masted tall ship proceeded elegantly northward. We hailed the Captain to express our admiration for the vessel and learned that not only is the British-flagged vessel, Jubilee Trust, one of only a few such ships in service, but its objective is to provide sailing opportunities for individuals with physical disabilities. Panama! Panama! 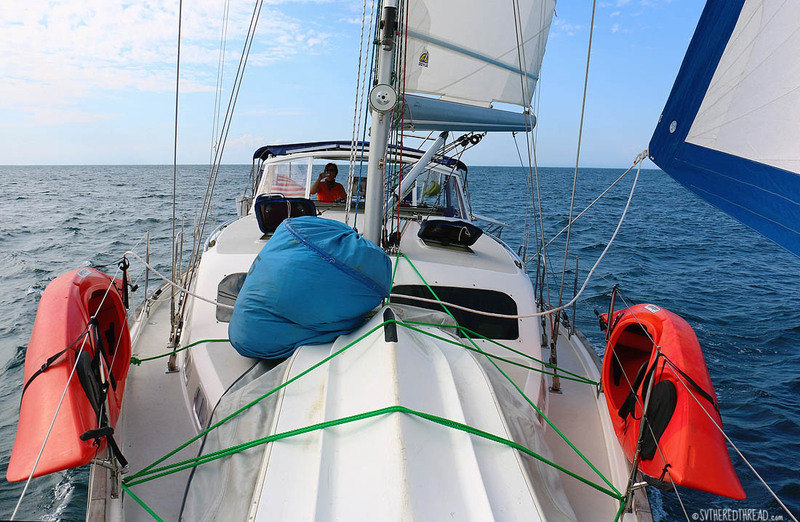 By 7 am, the spinnaker had us gliding through Costa Rica’s southernmost waters, like an oversized kite towing a child across a summer green. By early afternoon, Punta Burica—the headland that divides Costa Rica and Panama was visible on the horizon. When winds eased, we bobbed until a light northerly lifted the air once again. The breeze hastened as we rounded Punta Burica and crossed into Panamanian waters; we doused the spinnaker and unfurled the genoa. 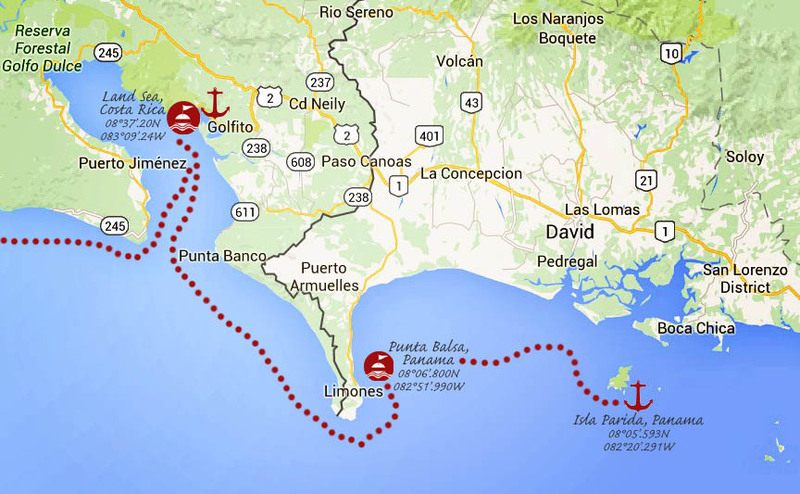 We decided to rest for the night at Punta Balsa, an indent on the eastern shore of Punta Burica, a few nautical miles from the promontory. However, attempts to set our anchor failed. We dropped the hook several times in 25 feet of water, and by the time I’d paid out enough scope to set it, we were in well over 150 feet! The bottom was an irregular confusion of knolls and chasms. 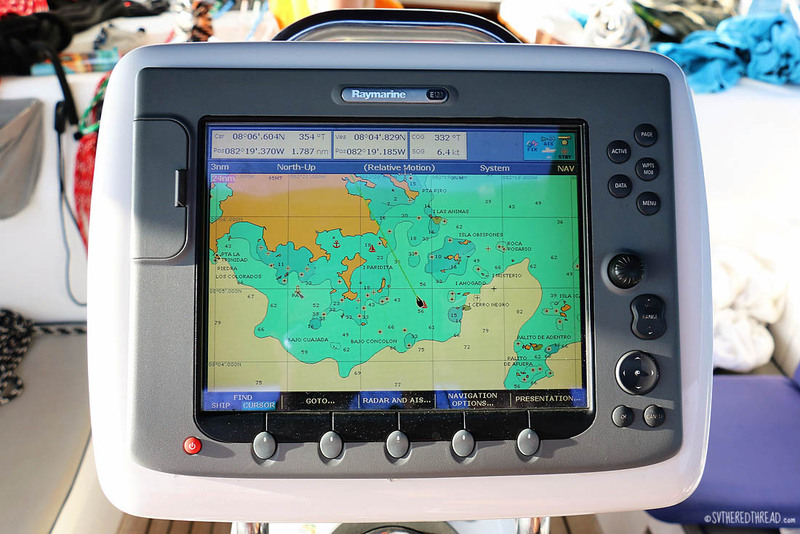 Our electronic charts illustrated the unusual composition in rows of blue and green scallops in overlapping rows. Daylight was fading quickly, and the evening was awash with grays that mirrored our frustration. 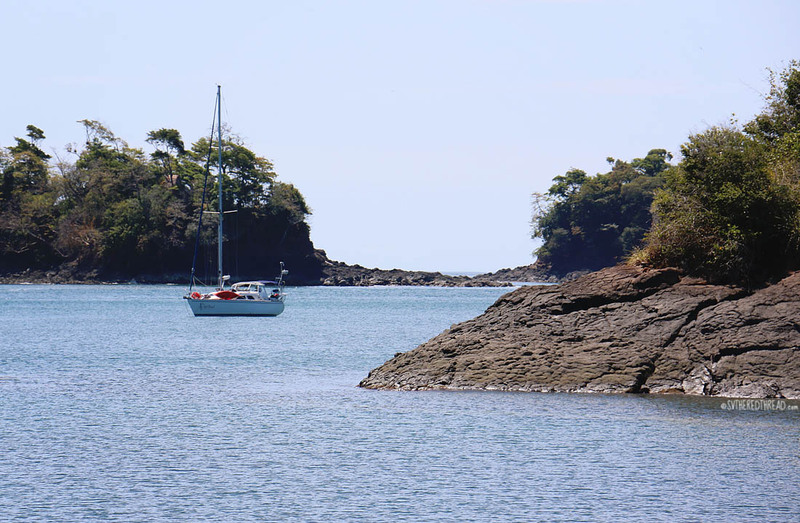 We motored along the coastline and must have looked rather helpless, as two men aboard a sport fishing boat pointed us toward a nearby mooring ball. Hallelujah! Dozens of rocky islets with bright green mop-tops fringe Isla Parida, like adorable munchkin chums. As we sped into the lee of the island, the wind dissipated and with it, down came our sails. Perfection. A single sailboat, Appleseeds, rested at anchor. Neil rowed over to introduce himself, while Lori and I made drinks, dinner, and the acquaintance of two adolescent island boys who paddled by asking for sugar (of course, we obliged). Neil made friends with our new neighbors and rowed back wishing their plans did not have them sailing north the next morning. Such is the cruising life – hellos, goodbyes, and hope-to-see-you-agains. Sail la vie. 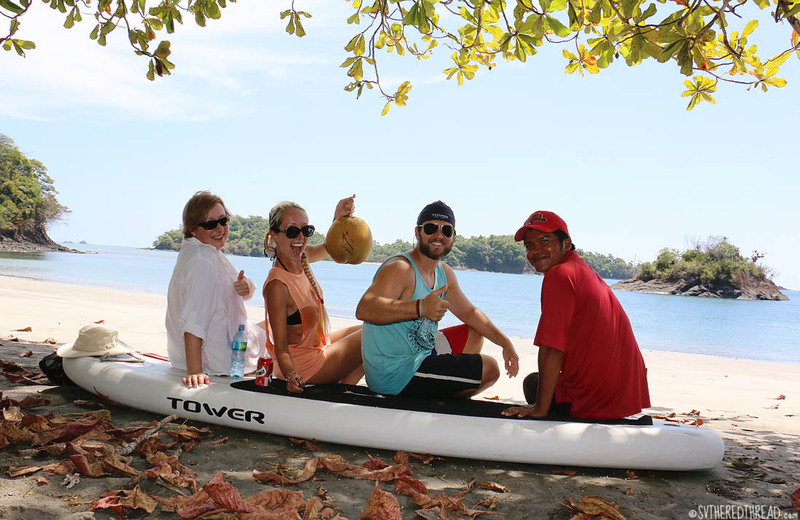 Having delivered bread to Frederico, as promised, we ventured to a neighboring cove, where a thatched-roof hut stood as a charming focal piece above a long-sloping sandy beach. 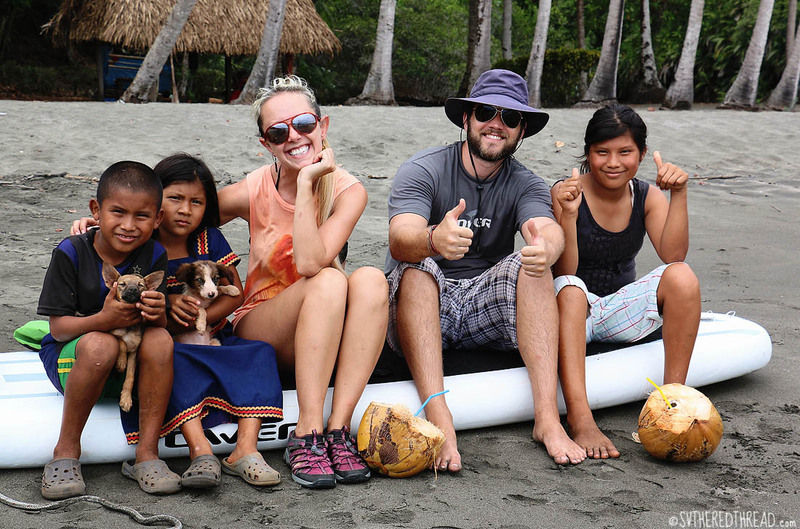 A handful of children spilled from the jungle, scampering down the beach to greet us. Opportunities to meet local folks is a gift of this mode of travel. Unconstrained by a hotel perimeter or tourism district, we explore nooks and crannies that would otherwise be overlooked and to meet people whose faces we’d otherwise never see. 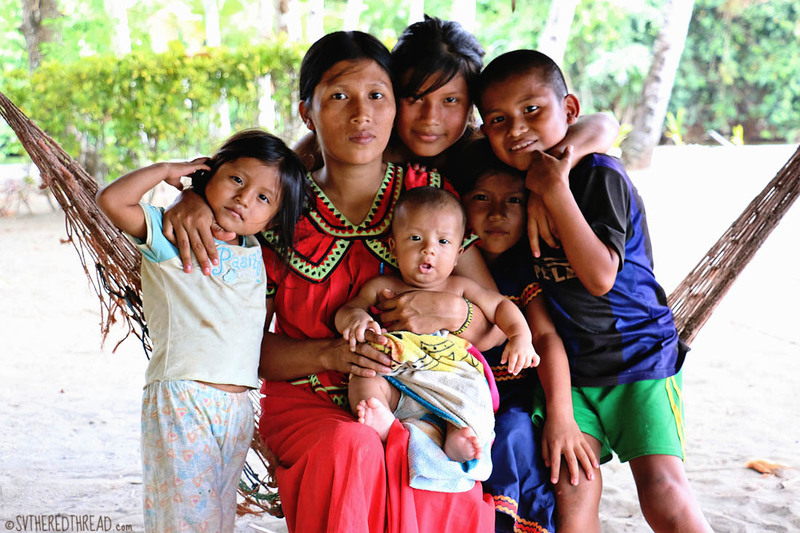 Upon reaching the palapa hut, we met Marlena, the children’s mother. She couldn’t possibly have been more than a few years older than me, but she had seven babies, ranging in age from 17 years to just a few months; we spent the day with five of them. They were a striking family; high cheekbones and expressive, dark chocolate eyes. From bashful to boisterous, the children were an absolute delight. They were easily entertained by the simplicity of our activities, which struck us as very different than kids in the US today, whose preference for electronic play (e.g., television, video games) is almost ubiquitous. 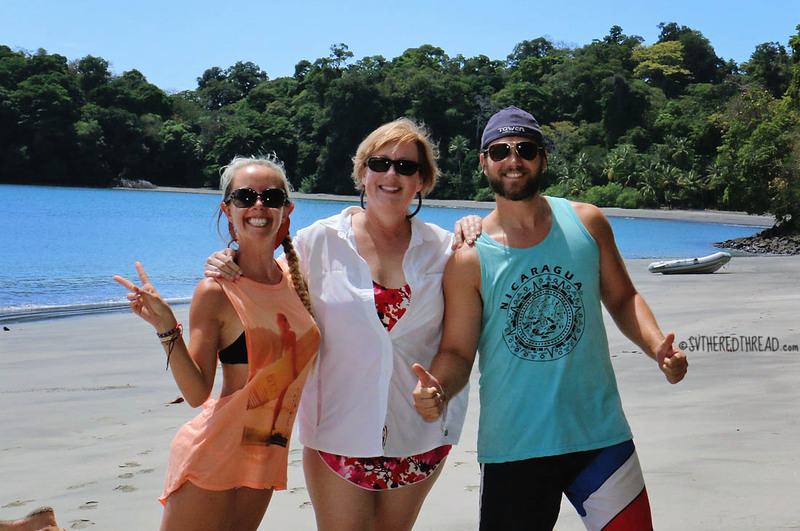 Together, we beachcombed for shells, drank coconuts, played with puppies, and flew our drone for the first time. Lori and I ventured ashore to say a final goodbye the following morning. In tow, we brought, a loaf of fresh bread, a big bottle of juice, a storybook, and a bundle of pencils and notepads. Only days later, Marlena and the kids would return to a mountain village on the mainland, where they lived near extended family and the kids attended school. Her husband (one of the three brothers) would remain on Parida to work. 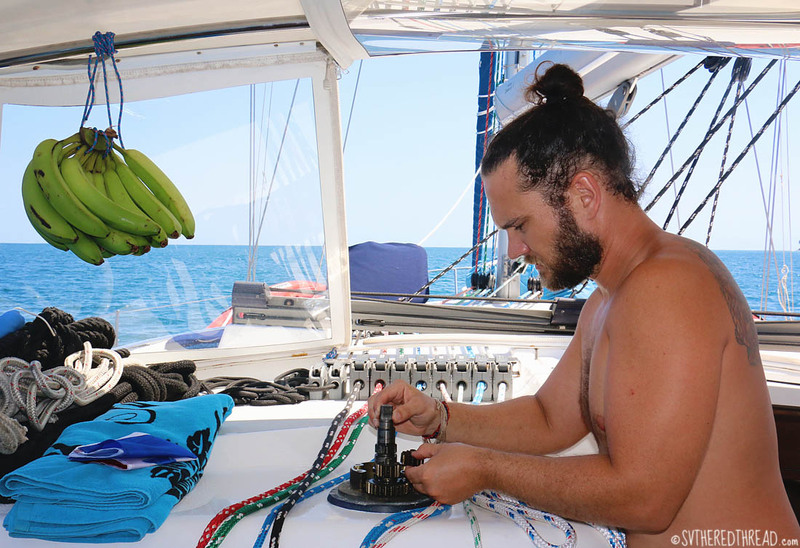 Despite encouraging remarks in our trusty Sarana Guide (“…a surprisingly calm anchorage”), Punta Balsa was one of the most atrociously rolly places we’ve ever stopped! If your aim in stopping is to sleep, you’d be better off heaving-to out to sea than stopping here, unless conditions are absolutely optimal! 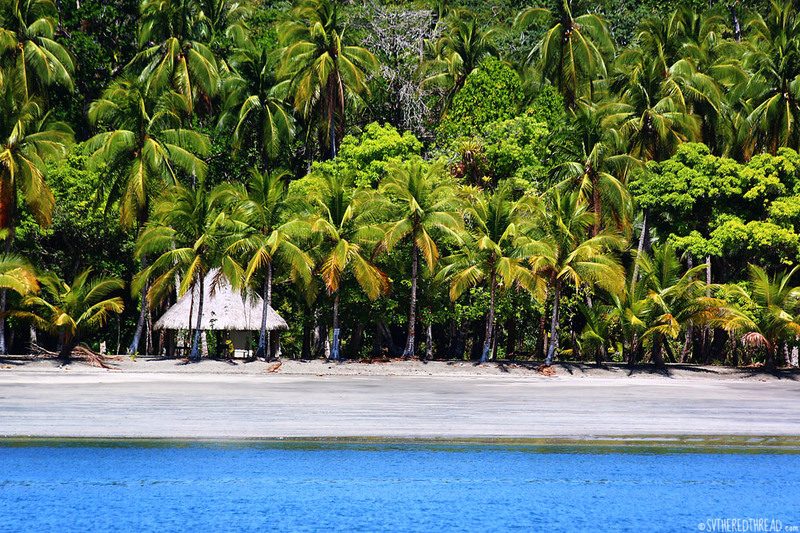 Isla Parida, on the other hand, should not be missed! 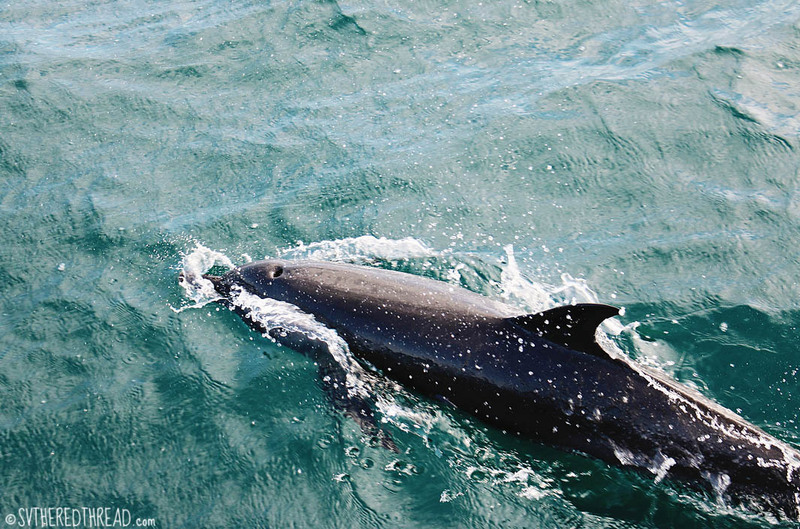 Although we can only speak of the southeastern anchorage, Ensenada del Varedero, we found Parida to be delightful! The few individuals who reside there are kind and generous, and the beaches are wonderful. The jejenes (no-see-ums) were hellacious, and we were disappointed that the water was too murky to enjoy a good snorkel (potentially due to churned-up seas from several weeks of hard papagayo winds), but those drawbacks should not deter you from enjoying a few days in this little slice of paradise. 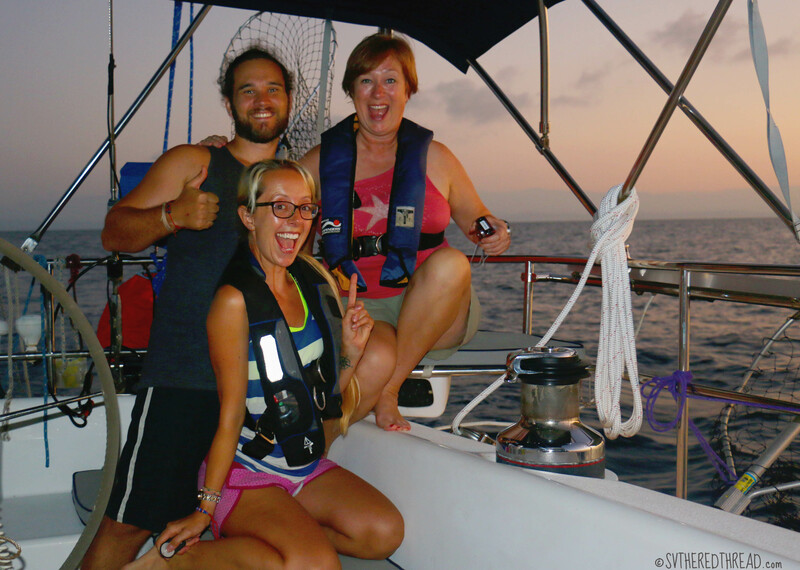 Jessie’s musings: The highlight of this stretch of sailing was LORI! She spiced the boat up with an exuberance that was contagious, and I thoroughly enjoyed having her aboard from the get-go. 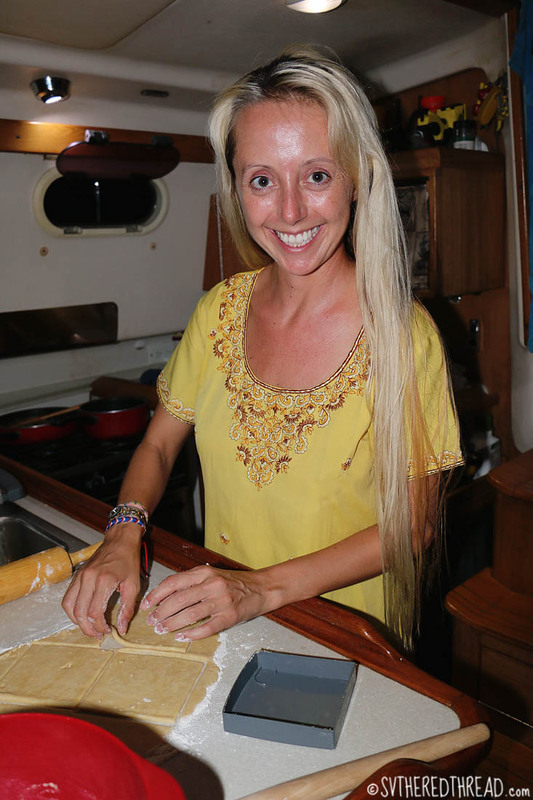 In fact, we have her to thank for the ingenious idea to use of one of our Raymarine gauge covers as a cookie cutter for empanada dough (brilliant, right?!). As for memories, the afternoon with Marlena and her children was the most special for me. It is always (well, almost always) a treat to spend time around kids, especially kids who are excitable, polite, and eager to engage. Watching them marvel at seashells and sprint unabashedly down the sand warmed my heart and made me wish we could linger longer. 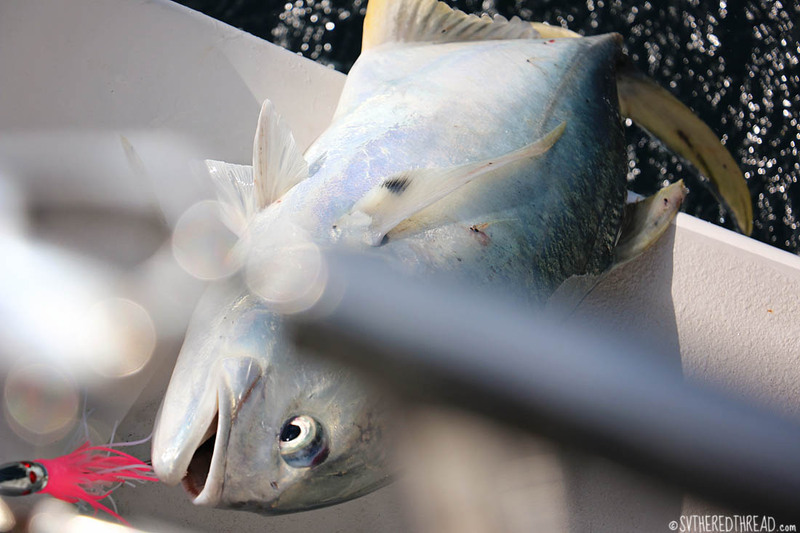 Neil’s reflections: After an epic day of spinnaker sailing, we almost hooked a tuna as we rounded Punta Burica, though we were trying a new lure that unfortunately didn’t produce (i.e., single hook, rather our usual double hook). 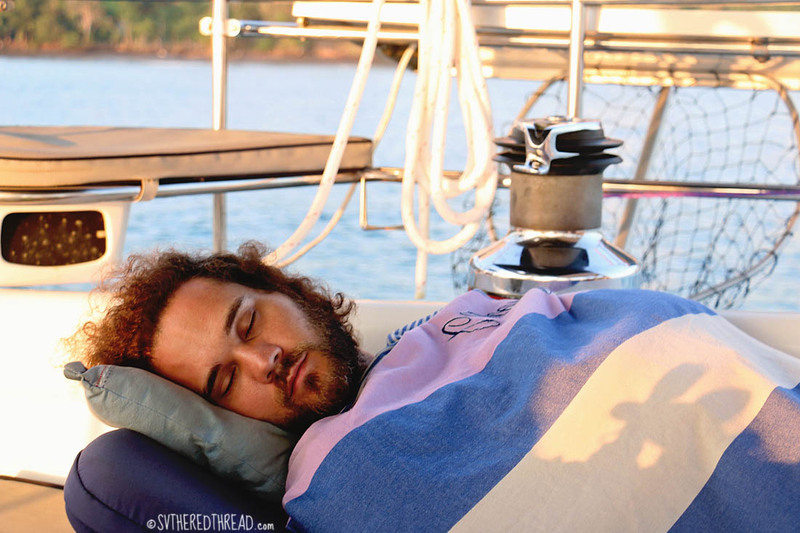 That night, we were treated to our most horrific sleep we’ve had at any point in our voyage. Parida, on the other hand, was an absolute delight (besides the mosquitos that came out at night) and offered a remarkably calm anchorage with stunningly gorgeous beaches. 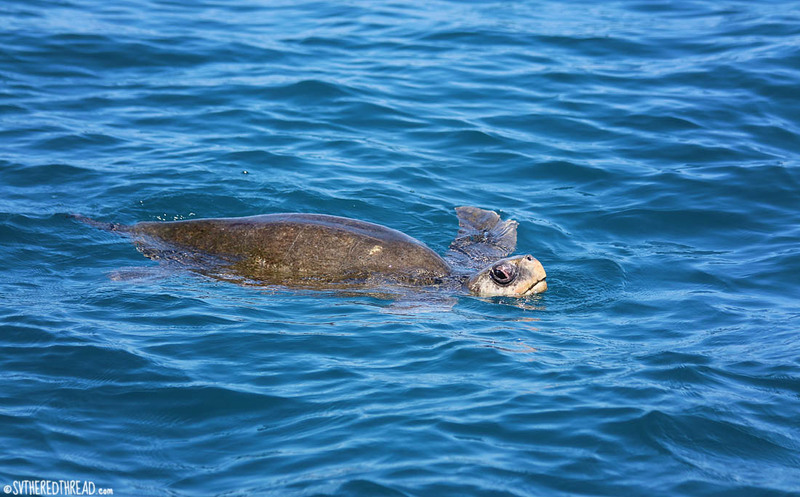 This entry was posted in By Jessie, Central America, Costa Rica, Fishing, Friends and loved ones, Panama, Sailing, Sea life, South Pacific Stitch and tagged Isla Parida, Jurel, Lori, Punta Balsa Panama, Sea turtles, Spinnaker sailing. Bookmark the permalink. Retirement cant come soon enough. Jessie, your words just flow onto the screen. I follow several blogs and yours and Neil’s is the best. Peace. 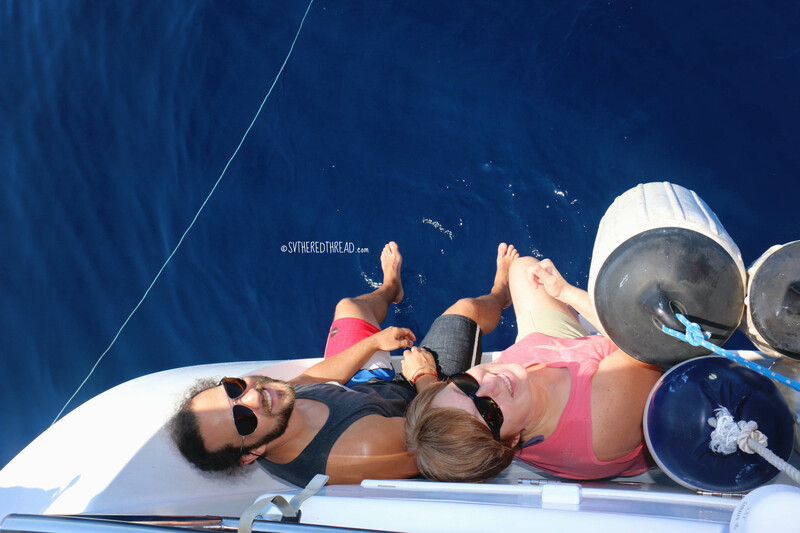 Omg just saw you guys on sailing la vagabond, so nice to see your smiles, guess I had fallen off the charts a bit. Loving the blog and so happy to have re connected again. Great vid ….where r u now? I am in need of a sail bag for our asymmetrical and noticed your blue one. Did you buy in Seattle? 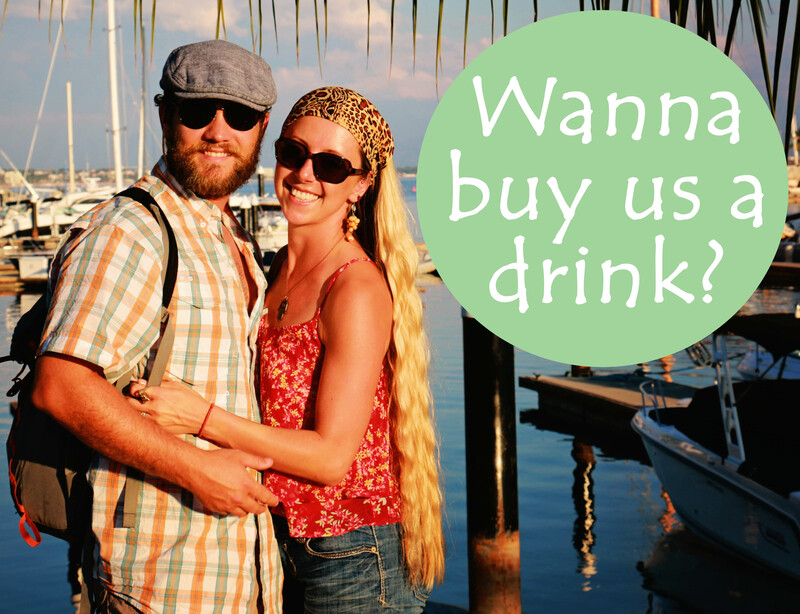 And you’d never guess it by our blog (because we’re so far behind), but we are in Bora Bora, French Polynesia!